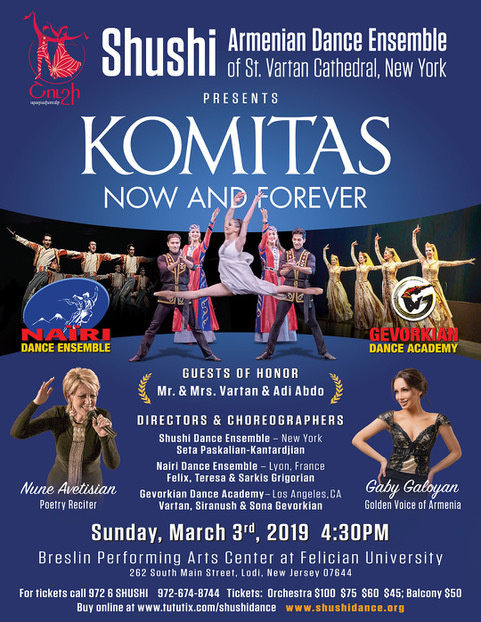 The Shushi Dance Ensemble of St. Vartan Cathedral of New York will perform its new show, “Komitas: Now and Forever,” on Sunday, Mar. 3, at 4:30 p.m., at the John J. Breslin Theater at Felician University (262 South Main St., Lodi, NJ). Guest performers from Armenia, France, California, New York will join the dance ensemble during the program. For tickets, call (972) 6-SHUSHI or click here to purchase online. Click here for more information and click here to view a flyer.